I have installed Dolphin x64 SVN R 3661 on Windows 7 x64. The Emulation runs successfull, but I can only control with my Mouse. Now I have connected my Wiimote to my PC (Bluetooth - Pushing 1+2 and so on...). I started Dolphin. -> Wiimote stopped blinking and just one blue LED is lighting. Under the "Recording"-Tab is just the Batterylevel shown, Roll and Pitch, G-Force and Accelerometer are empty. 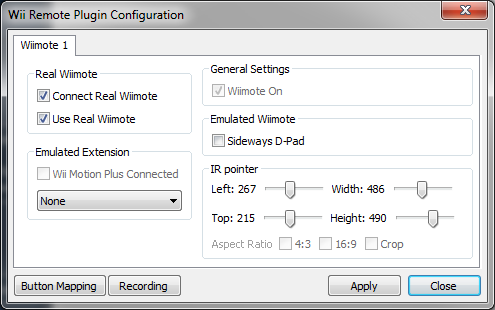 How does I have to configure Dolphin under the "Wiimote 1"-Tab, that Dolphin recognize the other things. I didn't found any help, which shows how to configure the Wiimote. With GlovePIE 0.29 I can get fully functionality of all functions of the Wiimote. You don't need to worry about the batteries at all. Just make sure you have Connect Real Wiimote & Use real Wii Mote both checked. And under Wii tab in Config make sure you have the correct sensor bar position, that should be all you need to get your wii mote to cooperate with dolphin. Yes, there are certain games that don't use the sensor bar at all; games that don't require you to point at the screen at all. Games such as this mostly have you using the sideways D-Pad the majority of the time. (08-12-2009, 11:24 AM)Diddy Kong Wrote: Yes, there are certain games that don't use the sensor bar at all; games that don't require you to point at the screen at all. Games such as this mostly have you using the sideways D-Pad the majority of the time.